Instead of a room with a view, we’re going to talk restaurants with a view! I think most of us need to slow down when we’re at Disney. It’s too easy to get caught up in the rush to Cars Land, the rush to get to the parks in the morning, the rush to eat, the rush to do most anything! I know when my husband gets ahead of me in the mornings because I’ve stopped to take pictures and turns to see masses of people passing him while he waits, it stresses him out. There may even be an occasional dirty look when I catch up. Maybe. If you find, like us, you’re having a hard time slowing down, meals are the perfect time to catch your breath. Everybody has to eat right? And what better way to relax and take it slow than eating at a restaurant with a great view. Here are 10 of them! 1. 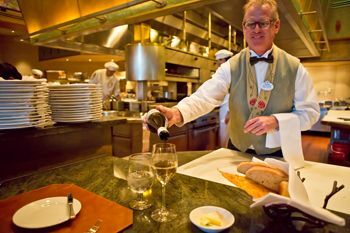 Chef’s Counter at Napa Rose – While many of the tables at Napa Rose in the Grand Californian have a neat view of a small section of Disney California Adventure, the views at the Chef’s Counter are the best there are. When you’re sitting at the Chef’s Counter you are just a counter away from the working kitchen. And working they are. Stunning dishes are prepared right before your eyes. They go out at a furious pace. I recently was able to experience the Chef’s Counter firsthand, and I was amazed at the experience as the chef answered our questions, gave us made-to-order entrees, and told us everything he was doing. It’s an incredible experience and one I’d recommend everyone try at least once. 2. Blue Bayou – Some would say you only eat here for the view and not the food, but I’ve never had a bad meal at Blue Bayou in Disneyland. A dark meal, sure, but not bad! The general darkness of the dining table area is all part of the atmosphere. Diners are literally just a few feet away from the Pirates of the Caribbean boats floating by. You feel like you are dining on someone’s back porch in Louisiana, and a beautiful back porch at that. There are lanterns overhead, fireflies, weeping willows and more. The atmosphere and views are just wonderful. It’s a don’t-miss restaurant for me. 3. Carnation Café – The Carnation Café is right on Main Street U.S.A.. There’s an indoor seating area as well as an outdoor patio. I greatly prefer the patio, out where the Main Street happenings are happening. Oscar, the park’s longest employee, greets Main Street guests in the morning and then makes his way through the restaurant to greet the diners as well. 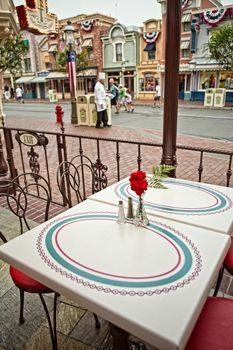 The red and white Mary Poppins-reminiscent décor is delightful. And bonus – the food is absolutely scrumptious. 4. Ariel’s Grotto – Ariel’s Grotto in California Adventure has some beautiful views of Paradise Pier and the wharf. California Screamin’ is launching just a short distance away. 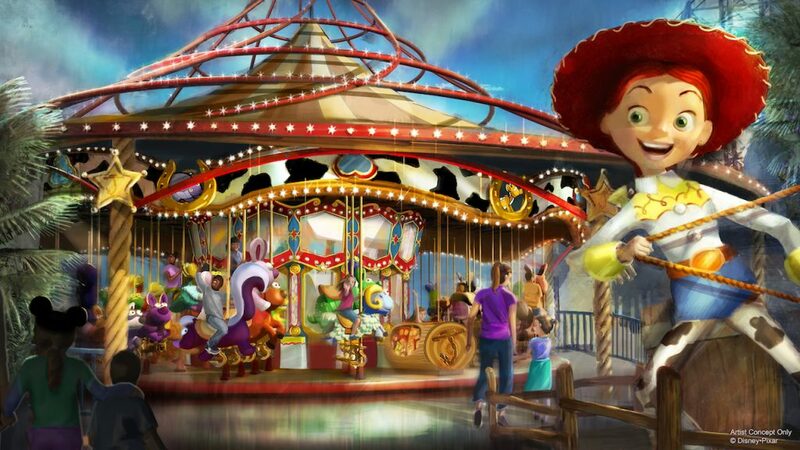 The Mickey’s Fun Wheel is turning, the Jellyfish are Jumpin’ and if the wind is less than like one mile an hour, so like once a week or so (? ), the Golden Zephyrs are a flying. The outside tables have 360 degrees of interesting views, but even the inside tables offer great views through the windows and an “Under the Sea” type feel for lovers of Sebastian and other cute crustaceans. Princesses are the main draw here of course, but the views are nothing to sneeze at! 5. Cove Bar – Does the Paradise Pier view sound good to you, but the idea of princesses visiting your table does not? Well then the Cove Bar right upstairs from Ariel’s is where you want to be. While it doesn’t have a full menu, it does have some yummy appetizers like lobster nachos to nosh on while you relax. The bar is outside and the views of the pier are perfect. At night you can even pay a cover charge of sorts and stay for World of Color. The angle isn’t perfect for all the elements of the show, but it’s good, and may be worth it to you to possibly have a seat and not fight the crowds. 6. Uva Bar – The Uva Bar has a fairly extensive menu for what is by name – a bar. With salads, entrees, appetizers, and desserts, you’ll likely see something that appeals to you. The big draw for me here, though, is the setting. The Uva Bar is smack dab in the middle of Downtown Disney. And when I say the middle, I mean the middle. There are stores and walkways on both sides. Everyone walking the length of Downtown Disney will pass by the Uva Bar. If you want to people watch – this is people-watching central. If you want to listen to the music and sounds of Downtown Disney while you eat, this is also the place. The location and setting are perfect for me! 7. Hungry Bear Restaurant – The Hungry Bear Restaurant in Disneyland in Critter County is somewhat tucked away from the crowds. These days it’s popular enough that it can get crowded, but the seating is plentiful. There are two decks to eat on, both with views of the Rivers of America. On a busy day you may see the Davy Crockett Explorer Canoes, the Mark Twain Riverboat and the Sailing Ship Columbia all pass by as you eat. Even with all the activity, it’s a pretty relaxing setting. 8. Café Orleans – Café Orleans in New Orleans Square is one of my favorite places to eat and not just for the views. I do love the food there. The views, however, are wonderful. The Patio overlooks the Rivers of America and all the bustling activity there. The last time I was there I had a great view of Jack Skellington and Sally entertaining park guests. It truly feels like a little New Orleans café. Well, not the Jack Skellington part. I’m not from Louisiana but I assume he is not a normal sight there. But the rest of it! Imagine the Mark Twain Paddleboat sailing (paddling?) by while you eat. That’s the views and atmosphere I’m talking about! 9. River Belle Terrace – The views at River Belle in Disneyland are very similar to Café Orleans, but it’s a quick service location. That means quicker and generally cheaper. It’s a great place to relax and watch the world go by as you eat your Mickey Mouse Pancakes. Or, Roast New York sandwich. Or, Tennessee Barbeque Pork sandwich. Or, whatever other favorite you may find there. 10. Carthay Circle Patio – Carthay Circle in California Adventure is such a stunning restaurant inside, that I probably wouldn’t recommend sitting on the patio if it’s your only chance to dine there. If it’s not, however, the patio is a pretty neat place. 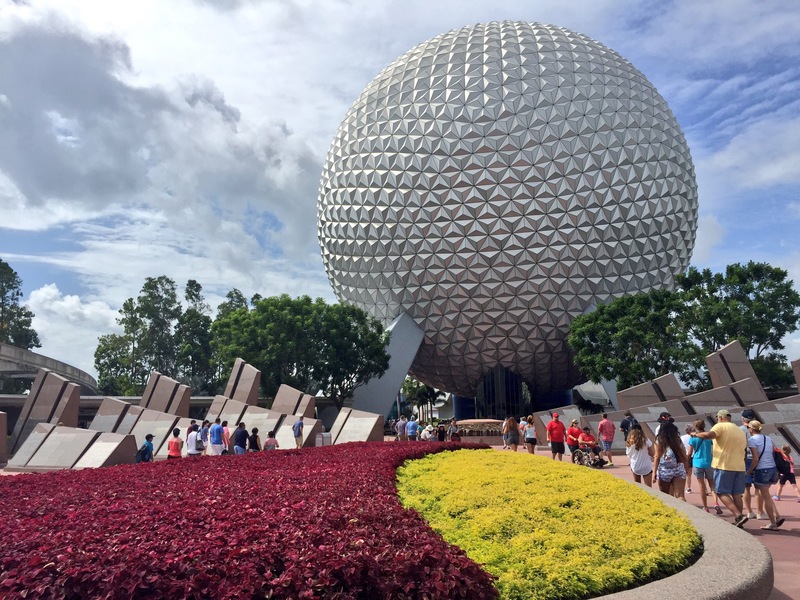 Arguably the busiest walkway in the park is right below you, so there’s a lot happening down there. People everywhere! You can see Soarin’ Over California in one direction, Grizzly Peak in another, and you’ve got a great view of the Buena Vista Street from there as well. Go check it out! 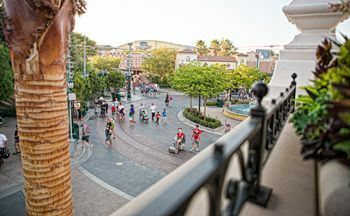 Where are your favorite restaurants with a view at Disneyland? I got all excited about this post because I’m headed to Disney in Novemeber. Alas, it’s for Disney land – not Disney world. Alas, there’s probably equally as good restaurants over here on the east cost. There are lots of restaurants at WDW with great views, Michael. You won’t be disappointed! Great post! We’re going to Disneyland for the first time in July (we are Disney World vacationers)and will definitely check out a few of the restaurants. I’m glad I could help, Karen! Thanks for reading! We ate at Blue Bayou in January for my birthday and it was incredible. We had a table waterside and it was by far the best dinning experience I’ve ever had. The lighting was a bit dim, but I enjoyed not having a big light overhead. It’s definitely worth splurging for. Can’t say I’d eat there again unless it’s a special occasion though. Dug pretty deep into the wallet. I’m so glad you liked it Doug! I love it too. The lighting is maddening for pictures, but it definitely fits the theming. I do agree, it’s expensive!